Kolkata, Oct 27 (IANS) The prize money for the 2018 FIFA World Cup in Russia has been increased by 12 per cent, president Gianni Infantino said here after the council meeting on Friday. Among the other issues discussed at the meeting here, a proposed combined youth World Cup instead of separate U-17 and U-19 events from 2020 onwards was also mulled while the Israel-Palestine standoff issue was closed without taking any action. An idea of doing away with the Confederations Cup and expanding the Club World Cup was also mooted. FIFA’s strategic body approved an increase in the prize money to a total amount of $400 million — 12 per cent up from the $358 million of the 2014 edition. “We want the bidding process to be bullet proof. So the criteria is more stringent for bidding,” Infantino told reporters here. 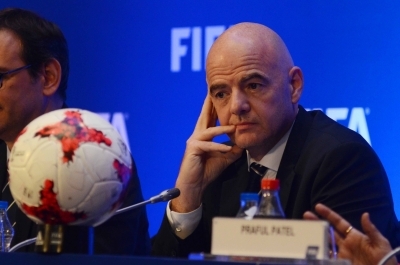 Infantino said that the Council also decided to close the long-standing Israel-Palestine impasse as football cannot solve political issues and FIFA will need to remain neutral in such matters. “We have taken a decision on the report of FIFA Monitoring Committee (of Tokyo Sexwale) on Israel-Palestine issue. The Council has taken note of all relevant documents including the United Security Council resolution. Infantino was speaking on the eve of the FIFA U-17 World Cup final between England and Spain and a third-place tie between Brazil and Mali. “We have limitations and FIFA will have to be neutral in political matters. This territories are a concern of competent international public law authorities and any interference by FIFA in the status quo in this territories in terms of football matter will further aggravate the football situation not only in these territories but in the whole area. “So, the FIFA Council has refrained from imposing any sanctions and declared the issue as closed until the legal and de facto framework has changed,” he added. Approval of the dates of FIFA Women’s World Cup France 2019, FIFA Club World Cup UAE 2018, , FIFA U-20 Women’s World Cup France 2018 and FIFA U-17 Women’s World Cup Uruguay 2018 was also given. The meeting took place on the eve of the final and third-place game of the U-17 World Cup. This is the first time a FIFA Council meeting was held in India.